I can never make my mind up whether it is best to thoroughly research a garden before visiting first-time round, clued up and laden with information. A good tactic but equally so is a full dive in without the background history. 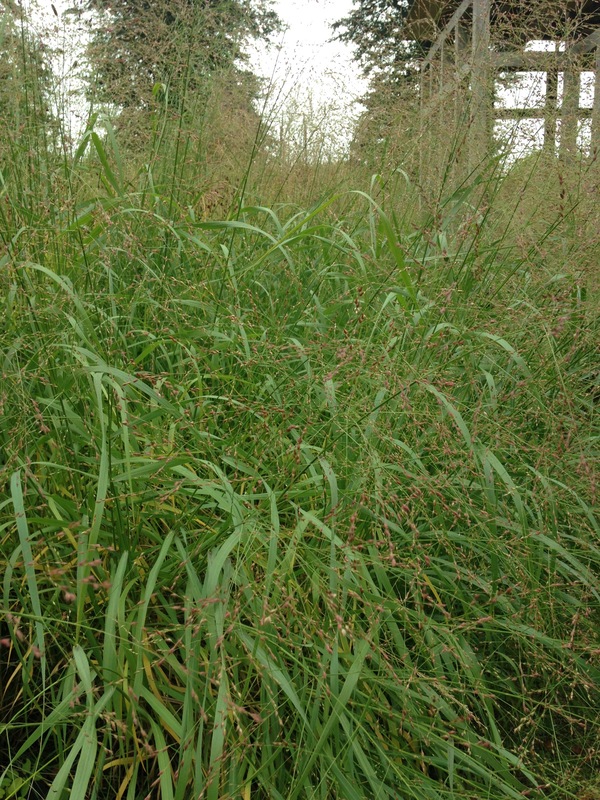 This can give a more sincere response to site, planting and atmosphere. Over the years I have seen images of the Front Garden at Bury Court by Christopher Bradley Hole garlanding the glossy magazines. It’s been on my hit list. Bradley Hole is one of the few Chelsea Flower Show exhibitors that pulls off show gardens that make sense, that stretch the eye and the mind with pared down planting. They are always presented within his habitual mathematical grids. His Latin Garden of 1997, a homage to Virgil is in my mind as if I am still standing in front of the display. Bradley Hole is a minimalist landscape architect. This translates as a philosophy of pure spaces and mathematical, harmonious proportions. He “uses natural materials which are used to achieve a hierarchy of details to articulate space and function”. His words, not mine and more of this later. Bury Court has two gardens. The above created in 2003 and round the other side of the house a Courtyard Garden. The tile-hung house with barns and oast houses sits comfortably in the middle of both gardens. The owner, John Coke, used to be a nurseryman with a famous collection of plants. In 1996 he and his then partner Marina Christopher (no mean plantsman in her own right) set the walled courtyard garden by it’s ears. 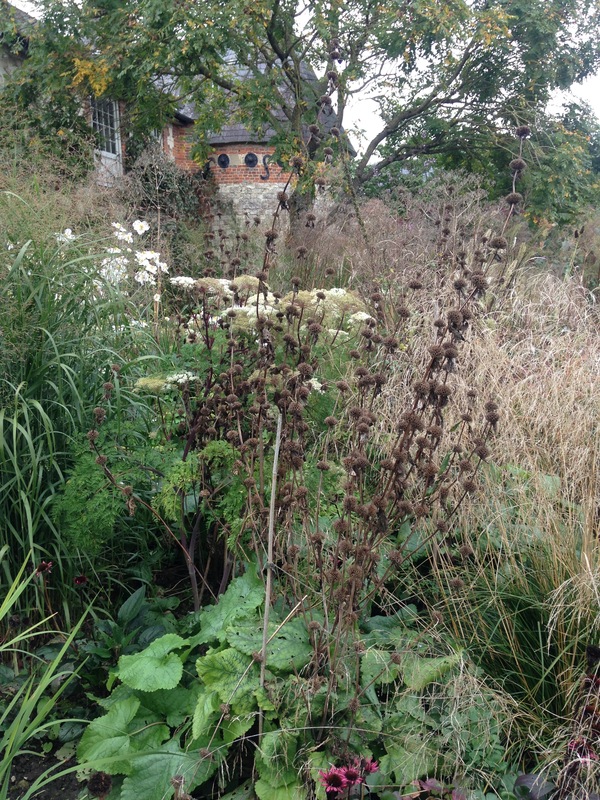 Engaged to help them was Piet Oudolf. Twenty years ago this was Oudolf ’s first English commission and the walled garden was a three way collaboration: Piet, John and Marina. There are Koelreuteria paniculata standards, a circular room of closely clipped silver pear and so many curves and domes of topiarised plant material. The wall pretty much closes off the view but if you stand on the pond rim a waving matrix of Calamagrositis Karl Foerster march out into the field petering out against a backdrop of miscanthus. Paths are of cambered setts and this with the closely clipped hedges and shrubs make a good skeleton lay-out for the pirouetting succession of perennials. 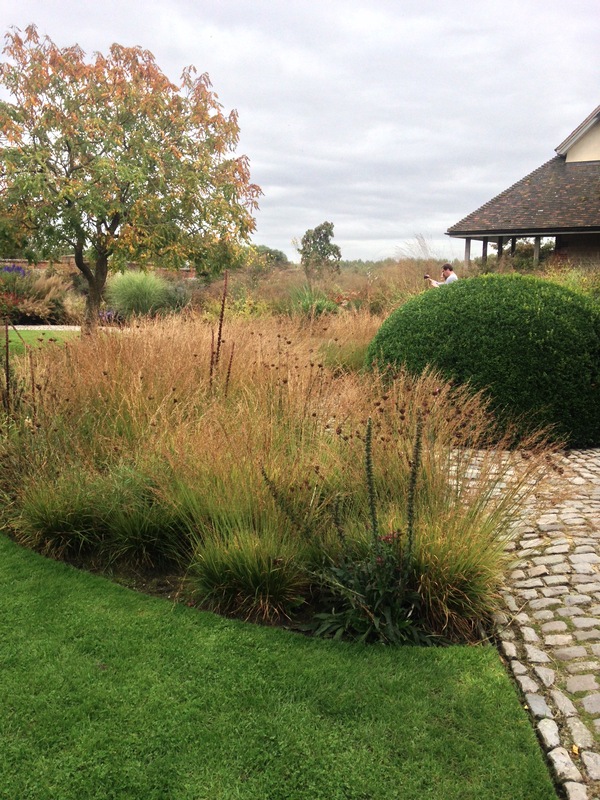 Our late September visit saw the miscanthus at full spate along with aconitums, asters, verbena and solidago. Selinum wallichianum jostling with pure white anemones and the bottlebrush of actea was evocative. 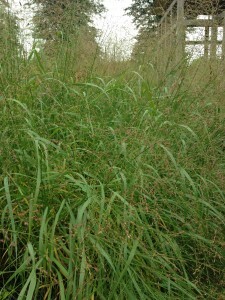 There are largish meadow patches of Molinia caerulea Paul Peterson co-planted with Dianthus carthusianum threaded through. And none of it looks dated – Oudolf evolves, innovates and quests for the new so earlier works never take a hackneyed tarnish. 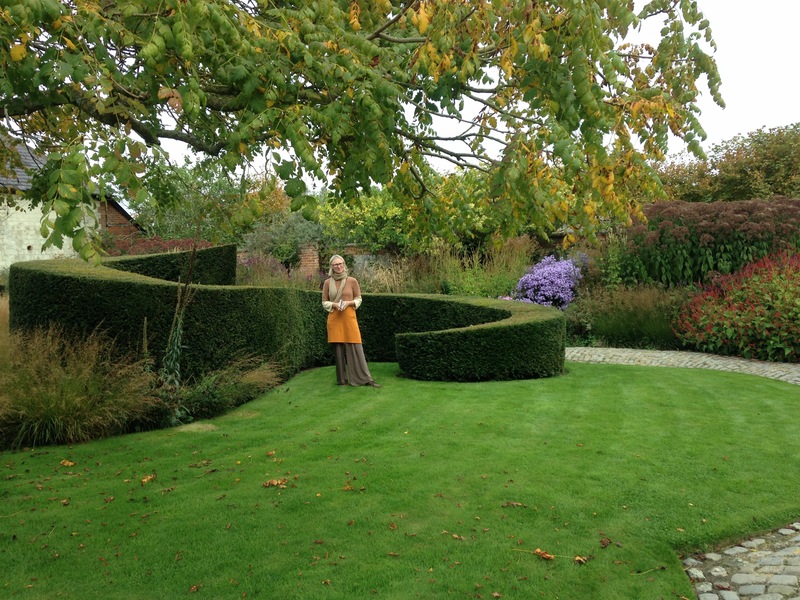 The interval between the two gardens was filled by Marina’s talk on on good plant subjects for winter form and interest. We scribbled in our notebooks, blundering with botanical spellings. 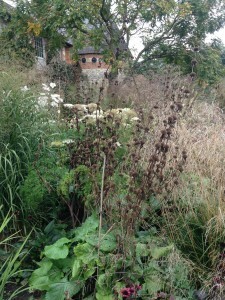 Bradley Hole’s garden, we were told, was behind the log pile and we were invited to be patient. An introduction to BH’s garden came with the suggestion that we should revisit in April. This would make sense to see the rigorous choice of hard landscaping materials and gridded pattern of 20 large beds edged in Corten. For now in September, we visitors become munchkins or dwarves swimming though giant plants. Miscanthus giganteus, Sanguisorba Korean Snow, Datisca cannabina and Helianthus salicifolia whipped around and towered above us and we crept like mice to the sanctuary of an oak pergola structure so that the sky would not fall on our heads. The water in the still black reflective pond was green, the oak grey and tired and the avenue of limes hard by on the farm track lowered over our Minpin scale change. Does it work? 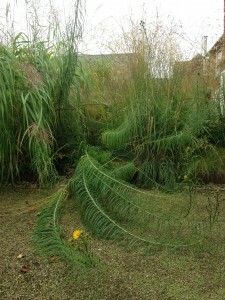 Marina told us that the plants were ripe for a lift and replant and I shuddered at the labour involved for plants of this size: the miscanthus at least will need a mini-digger. The Bradley Hole mission on soft landscaping is “drifts of herbaceous perennials and grasses, selected for structure, naturalistic character and mutual compatibility and maintenance qualities” The planting gets ten out of ten for structure and naturalistic character – I met a German design student swimming through the tallest grasses, she purred over this interactive garden. Mutual compatibility is a difficult one (when I am working on a scheme the book “Dream plants for the Garden”: Gerritsen/Oudolf 1999 is always at my elbow). Maintenance qualities? This courtyard is indeed a challenge for the brawny armed, strong legged gardener.